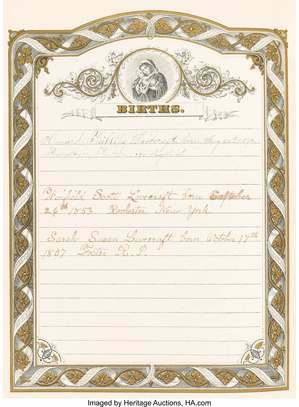 Lovecraft's legions of fans may be interested to hear that his family's 1881 bible, which contains his birth record and his parents' certificate of marriage, is currently on offer at Heritage Auctions. 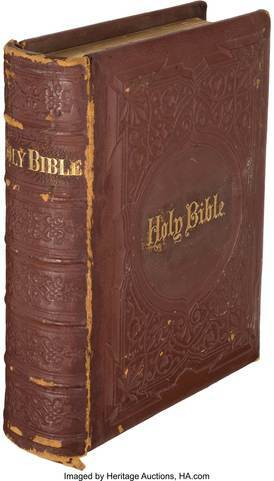 The now tatty leatherbound bible was gifted to his mother, "Miss S. Susie Phillips. From her Mother. March 22nd, 1889." As is typical with family bibles of this era, decorative leaves offer places to record marriages, births, and deaths. In this one, someone, presumably his mother or father, penned: "Howard Phillips Lovecraft born Aug. 20th, 1890. Providence, R. I., 94 Angell Street." A later inscription, in a different hand, notes the deaths of both Sarah and H.P. Lovecraft's fame as a writer of short stories in the horror and fantasy genres was, sadly, posthumous. (He died in 1937.) Today, he is beloved by fans, including Joyce Carol Oates and Stephen King, and collectors--in 2016, a typewritten manuscript of a story he is believed to have ghostwritten for Harry Houdini sold for $33,600.